Make Their Birthday Party Unforgettable. Are you getting bored of doing the same birthday party year after year? New Age Gaming has the perfect solution for you! Have a unique birthday party like never before. New Age Gaming offers you the most fun and entertainment that will make your head spin! Wait till you hear it! With the Mobile Game Theatre, they are presenting you the most awesome Game Truck birthday party! Have an unforgettable time with your friends and family by playing your favorite video games in a truck fully customized for the best and most fun gaming time you will ever experience! The New Age Gaming Mobile Video Game Truck has many features. With seven wide-screen and HDTV, a surround sound system, special lights its certain that you will have the best Game Truck birthday party you have ever imagined. The New Age Gaming Mobile Video Game Truck has the most popular and best game consoles such as Playstation VR, Playstation 4, Xbox One, Xbox 360, Wii U and Wii which are all connected to the HDTVs. For your Game truck birthday party New Age Gaming offers a variety of games in their Game Library which you can choose from. And parent, don’t worry if you feel like some game isn’t appropriate for your children. You can just inform them and they will exclude it from the game options. We saved the best for last! 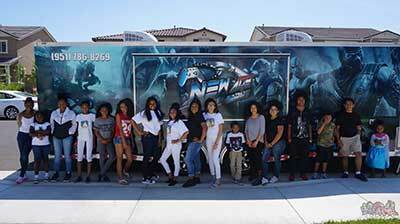 The New Age Gaming Mobile Video Game Truck will be the one that will arrive in front of your house or in the nearest place where it would fit in. They’re bringing the most exciting Game Truck birthday party in your neighborhood! But wait, that’s not all there is! With the brand new and exclusive Laser Tag system, New Age Gaming can throw you a unique Laser Tag birthday party that you have always been dreaming of. But not any kind of Laser tag birthday party! The New Age Gaming Mobile Laser Tag Xperience includes the best Battle Riffle Pro and Battle Riffle Pro XL that offer many features such as multiple weapon choices, reloading buttons, adjustable magazine sizes and so on. 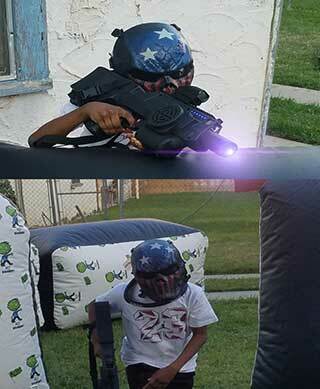 And probably one of the best things is that Laser Tag birthday party takes place in your home or backyard. Your only job is to inform New Age Gaming about the date and the features that you would want to be included in the game and they do the rest! With the finest and one of the products with the highest quality in the Laser Tag industry, the Battle Riffle Pro and Battle Riffle Pro XL offer a real lifelike battle experience with more than 60 sound effects and a system measuring your health and ammunition. And last but not least, forget the heavy and uncomfortable vests, this high-quality laser tag system uses specially made headbands instead of the old-styled vests. Feeling excited? And you should be! Give New Age Gaming a call or write them an email today and they will start planning your Game truck birthday party or your Laser Tag birthday party today! Have you always been dreaming of being the cool parent? This is your chance to prove it and be one! Surprise your kid with one of our Game Truck or Laser Tag birthday party! WE SET UP, ENTERTAIN, AND WE CLEAN UP! Game Coach(es) to assist the event. Four 55″ HDTV’s and One 60″ Smart HDTV. Two 55″ Smart HDTV’s on the outside of the Game Truck. Surround sound for each TV. Interior stadium seating and Laser light show. Xbox One, PS4, Playstation VR, Nintendo Switch, and Oculus Go . Climate Controlled Theater & 10x10 EZ-UP. 3 Hours of Mind Blowing Fun! 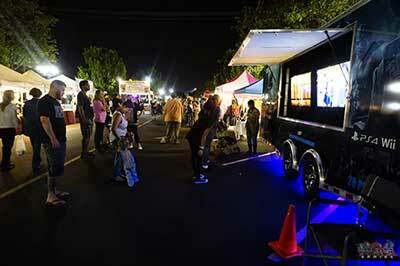 Combine the excitement of our Video Game Truck and Laser Tag Party. 1.5 Hours of gaming on the newest consoles including Nintendo Switch! 1.5 Hours of laser tag with our industry-leading laser tag rifles and battle system! Book today to ensure we're available for your big day. This is the ULTIMATE party package. 2 Hours of simultaneous Video Games and Laser Tag. Accommodating 40 guests. A great value that cannot be matched or duplicated by our competitors. While your 14 of your guests battle on the laser tag field, 28 guests can enjoy our luxury Video Game Truck. This package is available Monday Through Sunday. Book Quickly to lock in this your next party at this great price!